Bagels Etc is one of those places that people have been telling me to see for some time but I never get around to checking it out. Those who recommend it are big fans of it, so one nice Sunday, off we went to explore and it did live up to the hype. Bagels etc. 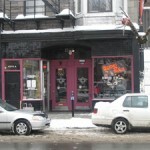 has been around since the 1980’s and has made for itself as a great little brunch place that offers more than just bagels. 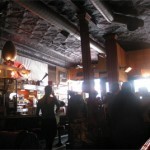 They bang out delicious meals, and do so in a funky and laid back atmosphere. 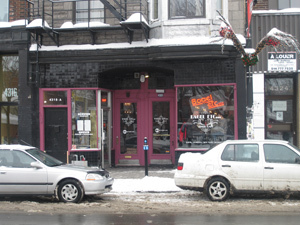 The exterior is very unassuming and has a simple neon sign that does not stand out that much during the day. 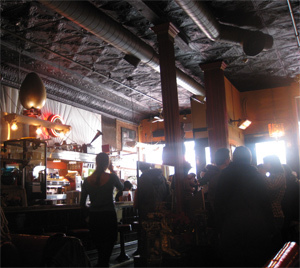 Once you walk in you see a really eclectic mix of what can best be described as old time diner-meets-burlesque bar. It has an old school cash register and a giant golden egg on the the top of the north wall. The seating options are not tremendous as it can likely hold 50 plus although if you do not show up before 11:00 or make reservations you will have to wait a while since the lineup can get long. Although, on the plus side they do have 2 old sofa seats at the front so you can be comfy while you wait. The menu at Bagels Etc. is rock solid. There are 4 french toast options all in the $9 range – one of them even comes as challah bread which is always a special treat to see something different and more inclusive. The pancakes are in the $6 range and have 3 choices. 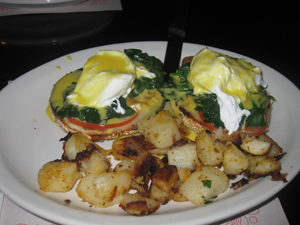 There’s 9 special plates that consist of 7 eggs based plates including such classics as ‘huevos rancheros’ for $8.75 as well as 2 non-egg plates like ‘croque ton’ and ‘croque chevre’ (melted goat cheese, tomato, and oregano) for $10.95. Omelettes come with 7 options all in the $10 range almost half of them are vegetarian, and the Tunisian is very interesting since it comes with Tuna and next time I go I will definitely try it out. 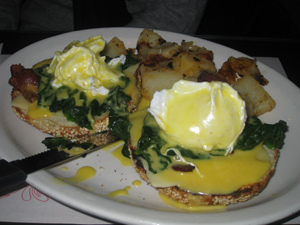 There are 8 choices of eggs Benedict ranging from $9.75 to $13.95. The Dalilah $13.95 comes served on a bagel with bacon, spinach and we opted for an extra slice of cheese that really brought out the taste. 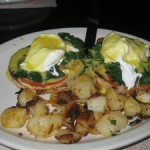 The Bysantine $13.95 came with melted goat cheese, spinach and tomato and potatoes. The goat cheese was really pronounced and made the plate. Also, the holondaise sauce was perfect, not to mention the egg had a thick outside yet a slightly liquid center (a better cooking job they could not have done). The only down side was that the potatoes were not awesome, they weren’t bad just average but I was never a big potato fan so no tears were shed. The Romanoff was very interesting since it came with smoked salmon and cream cheese and was recommended as a house specialty, although we stuck with our 2 choices opting to have it next time we come. Our waitress was loads of fun, she made the ordering process fun and was very informative. She also checked up on us often and refills were plentiful. There are some vegetarian options on the menu although many dishes have an aspect of meat and or fish in them and there is no health menu, well maybe the bagels section but you still have choice. I really enjoyed this place, food was tasty and portions were generous. The service was good, ambiance was really fun since we saw something new every couple minutes. Lineups can be long so come early or reserve ahead if you are a big group. As well they don’t take debit cards (credit cards and cash yes). We waited 45 minutes to get a table. We were 2 and first in line, but groups of 3 and 4 people behind us were repeatedly fast-tracked right in front of us. Once we got a table, we counted 13 seats available while 25 people were waiting at the door. On top of not being able to manage their restaurant, they just don’t care. The owner is just clueless about management and customer service. The food is very average, totally not worth the wait and the hassle. Do not waste your time and money. Head somewhere else. Awful management and service. They need a training in basic skills. Absolutely mediocre in every way. 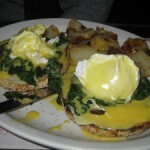 Why does it seem to be so difficult for brunch restaurants to cook eggs? It’s like, 95% of their job.